Whether you are recuperating from surgery, an accident, or dealing with aging, chronic illnesses or disease processes, we know that it’s sometimes difficult to perform activities of daily living. Known as ADLs, these activities include bathing and dressing, meal preparation, toileting, and continence care. We at Delicate Home Health Care know that it can be tough to deal with some of these issues, mentally, and physically. No one wants to have to rely on someone else to help him or her perform such activities. However, there may come a time when you need a little extra help with bathroom assistance, including toileting or bathing, getting dressed in the morning, or for bed at night. We are here to help. 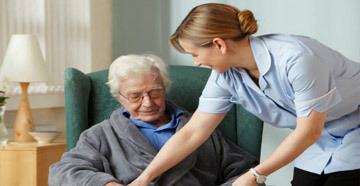 Home health care aides at Delicate Home Health Care provide professional, courteous, and compassionate care for all your personal care needs. Such care is provided on an hourly basis (4 hour minimum), or 24 hours a day, based on need. Our home health care aides are well-versed in the use of assistive devices as well as methodologies that ensure optimal safety and security for our clients when it comes to personal care needs. Reduce the risk of a loved one slipping in the bathtub or while trying to get to the toilet. Our experienced staff and home health aides povide the safety you or a loved one needs getting into or out of the tub or shower enclosure. We provide either hands-on support or cued supervision, depending on scenario. orweekly, to ensure that you or your loved one is following dietary recommendations based on doctor’s orders or medical conditions regarding nutrition. We understand that many seniors may feel hesitant to ask for help with daily personal care needs, but rest assured that the staff at Delicate Home Health Care treats every client with dignity and respect. Patient-centered care is the focus of every one of our services. Whether your personal care needs are caused by surgery limitations, partial paralysis, or a chronic illness, Delicate Home Health Care is available to help improve and maintain optimal mobility and independence. Contact us at 1-800-216-0372/703-334-0105.